My scientific name is Acinonyx jubatus. I can run over 100 km/hr (62mil. /hr) but only for short distances. I am the only feline with non-retractable claws. Who am I? You certainly guessed it, unlike CyberDodo, whose house is still recuperating from my visit! CyberDodo and the Turtles (1-24) CyberDodo plays tennis with some monkeys and he’s not doing too well. Aside from that, from each ball that he picks up a baby turtle drops out. 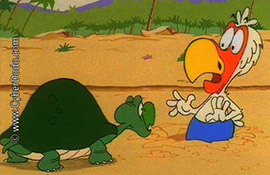 Their mother, very unhappy by now, will have to intervene and explain to CyberDodo who the turtles are and why it is so important to protect them. 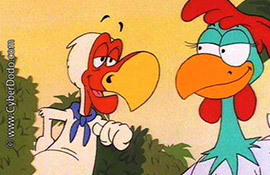 CyberDodo and the Farmyard (1-25) CyberDodo falls in love with a hen who he mistakes for a female Dodo. Faced with his ignorance, she explains to him what a farmyard is and who the animals are who live there. CyberDodo and the Seashells (1-26) CyberDodo wishes to marry the hen. 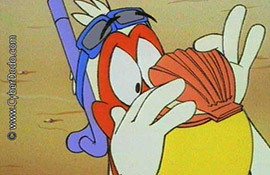 Wanting to offer her a ring, he goes on a reckless quest for a pearl and opens a mound of seashells. Seeing this new mistake, the pelican must once again give him a lesson. 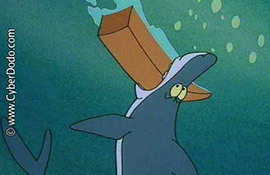 CyberDodo and the Sharks (1-27) CyberDodo is sent out to sea by a rival. Upon encountering a dangerous shark, he is saved by a dolphin who will explain to him the differences between the 2 species. CyberDodo and the Rhinoceros (1-28) CyberDodo is in Africa, the cradle of humanity. 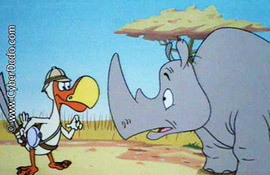 There he meets a rhinoceros who will tell him about his troubles and about why his species is at risk. 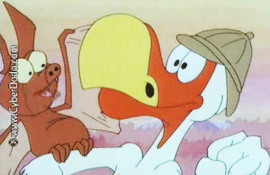 CyberDodo and the Bat (1-29) Hiding in a cave, CyberDodo is scared stiff when he comes face to face with a bat. He will more than welcome a few explanations to appease his fears.